Sulfas are considered all anti-bacterials (antimicrobials). These drugs are bacteriostatic, meaning they inhibit the growth of the bacteria but do not kill them. Sulfa drugs arrest cell growth by inhibiting the synthesis of folic acid, a component required for growth by bacteria. Folic acid is a large molecule and is unable to enter bacterial cells, so the bacteria must synthesize the compound intracellularly. Animal cells are unable to synthesize folic acid and it must be provided in the diet. For this reason sulfa drugs are not toxic to animal cells. Sulfa drugs are among the oldest in the medicine, the first being a sulfonamide was trade named Prontosil dating back to experiments by Bayer in 1932. 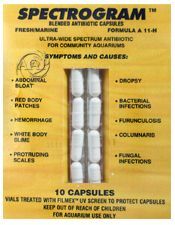 For aquatic use Sulfa are often maligned by many aquarists as not effective or out of date, yet in reality Triple Sulfa often will work where other antibiotics fail and sometimes with less side effects as well (this is not to say Sulfas do not have side effects as they are somewhat toxic, producing blood abnormalities and kidney damage when indiscriminately used). Sulfas also do not tend to be as sensitive to poor use (meaning not following the full treatment regimen). USE: A relatively broad spectrum antibacterial medication; for fin and tail rot, mouth fungus and clamped or collapsed fins, Columnaris (mild to moderate infections ONLY), and hemorrhagic septicemia (although not effective to Aeromonas infections of the gut). Triple Sulfa is very effective for basic Fin Rot infections with Pseudomonas as the bacterial pathogen. It is also useful for damaged fins caused by fin nipping. Sulfas are still one of the better anti-microbials for wounds or large sores (Nitrofurazone and Neomycin are other potential choices or possible combinations). Use in combination with Neomycin for stubborn sores, in particular lower pH aquariums/ponds is also a consideration. Triple Sulfa is often a good choice when there is an infection caused by a scrape, abrasion, or similar. While not often the first choice for fish eye issues, including pop-eye, it can be a first choice or a second choice if the first choice fails in treating such maladies involving the eye. This would not only include and in-tank treatment but use as part of a "Fish Bath" treatment too. An old standby that is still useful and can be used in combination with Malachite Green (especially effective in combination with MG at ½ strength when treating Ich in scale less fish) or Acriflavin (do not combine with copper sulfate). In fact when fish are otherwise healthy but for an injury or a few mild to moderate symptoms (such as redness), Triple Sulfa (or Super Sulfa) were often the go to treatment of choice with my aquarium maintenance clients. I generally reserved stronger treatments such as the Furan 2/Kanamycin combination (Spectrogram) for later or full blown infections (which were more common with "fish doctor" calls, not my regular clients). It is noteworthy that Sulfas are more effective at higher pH levels which is an important point for many fishkepers. 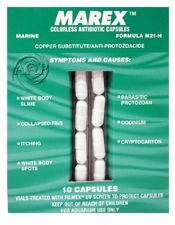 Sulfas can also be safely used with other mild broad spectrum parasite/fungal treatments to boost anti bacterial effectiveness,; a good example would be the Medicated Wonder Shell. DOSAGE: 250 mg per 10 gallons every 48 hours (24 hours for severe issues) with a 25% water change before each treatment. Treat for a minimum of 10 days. *Best not used concurrently with other antibiotics/antimicrobials, although use with chemical dyes such as malachite green is safe and even advised. Trimethoprim is a bacteriostatic antibiotic effective for many aerobic gram negative bacterium including Pseudomonas & Aeromonas. Since Pseudomonas & Aeromonas are common causes of opportunistic fin rot in fish (assuming the causes of this opportunity are negated), this drug or a combination that includes it may be a good alternative treatment. In fact when combined with some Sulfa based medications, it produced a synergism or addition in 85% (similar to how Kanamycin and Nitrofurazone produce a synergism that treats Columnaris and Aeromonas that when treated alone, often results in failure). However Trimethoprim has no proven effectiveness for anaerobic infections, so if the causes of an Aeromonas is anaerobic (which most are), then this or antibiotics containing Trimethoprim would be a poor choice. USE: A good alternative to 100% sulfas, although a more harsh antibiotic toward nitrifying bacteria. Especially useful for fin and tail rot. *Can be very harsh to nitrifying bacteria in an aquarium, do not over dose and use only in well established aquariums. *Can cause Thrombocytopenia (lowering of blood platelets), so this is a poor choice if fish have large wounds or are suffering from septicemia. A better choice then would be a pure Sulfa product or other medication combination. USE: Tetracycline is the name of a large class of antibiotics produced by Streptomyces bacteria. These include Tetracycline Hydrochloride (to be discussed here) and several others which, although closely related, often yield very different results (although side effects may be very similar). With this in mind it is important to not confuse these very similar but often very different in results antibiotics. Unfortunately this is done all too often, especially for the treatment of Columnaris (Flexibacter). Minocyline which can be effective (not my first choice for Columnaris though) is often confused with Tetracycline Hydrochloride. Tetracycline Hydrochloride is a naturally occurring Tetracycline used in the treatment of bacterial infections that are generally gram-positive such as Streptococcus and SOME gram-negative infections in fish. It interferes with the production of proteins that the bacteria need to multiply and divide (bacteriostatic). However many bacterial pathogens have developed resistance to Tetracycline Hydrochloride. Tetracycline Hydrochloride is generally more effective for aerobic bacteria (which Columnaris is only aerobic however Aeromonas and many other pathogens can be anaerobic). It should also be noted as to Columnaris that although it is aerobic, it is also gram negative, whereas Tetracycline Hydrochloride is less effective for gram negative bacterium. It is noteworthy that a member of the tetracycline family; Minocycline hydrochloride is more effective for gram negative bacteria than Tetracycline Hydrochloride. Uses include (generally gram positive causes of these symptoms); fin and tail rot (split, ragged and deteriorating fin and/or tail), Popeye (protruding eyes, may be cloudy or hazy), gill disease (swollen, discolored gills, gasping for air and a decrease in activity) and secondary infections. Tetracycline Hydrochloride mode of action is as a protein synthesis inhibitor via an aminoacyl-tRNA binding mechanism to the 30S subunit. Mode of resistance is the loss of cell wall permeability. Note, Tetracycline can lower red blood cell count and cause anemia, because of this I would not use with injured fish, as this is the last thing you want to do with a bleeding fish. Tetracycline becomes dangerous past its expiration date. While most prescription drugs lose potency SLOWLY after their expiration dates, tetracycline can become toxic over time. This can be a useful antibiotic, especially when others fail, however Tetracycline is more useful in warm blooded animals (humans and Veterinary) than in fish. I have often found the side effects to outweigh the benefits in aquarium use (such as anemia and interfering with nitrifying bacteria, often producing a “brown foam” on the surface of the aquarium), especially for marine aquariums. For this reason (destruction of nitrifying bacteria) I strongly recommend against the combined use of Tetracycline AND Erythromycin (the side effects of these two antibiotics combined will generally negate any benefits obtained when used in combination). Another note with Tetracycline Hydrochloride is that it is easily absorbed where calcium is present in larger quantities, which often renders this antibiotic useless in saltwater and high GH (hard water) freshwater aquariums. *Best not used concurrently with other antibiotics or chemical treatments (including Malachite Green (See note), although use in a bath with Methylene Blue is OK. NOTE: Not recommended in combination with Malachite Green based on the fact Malachite Green is generally used for external parasites that can lower red blood cell count and that MG is more effective & safe at higher calcium levels while Tetracycline is the opposite. USE: Minocycline hydrochloride, also known as Minocycline, is a member of the broad spectrum tetracycline antibiotics, and has a broader spectrum than the other members, especially as to gram negative bacteria where Minocyline has more activity (albeit still limited effectiveness when compared to other gram negative antibiotics). Minocycline is also synthetic whereas Tetracycline Hydrochloride and Oxytetracyline are naturally occurring. It should also be noted that Minocycline maintains serum levels 2-4 times that of most other tetracyclines (150 mg giving 16 times the activity levels compared to 250 mg of Tetracycline Hydrochloride at 24-48 hours). It has excellent anti-inflammatory properties which makes it a good choice for septicemia, although for Viral Septicemia there is no effective treatment, only prevention. Minocycline is also effective for some causes of fin/tail rot and OCCASIONALLY pop eye and is sometimes suggested for dropsy. However as for Dropsy I strongly recommend against this as this antibiotic can cause severe kidney damage, which is the last thing you want with a possible Dropsy case. However Minocycline (Maracyn 2) is not generally a good first choice for fish with sores; Nitrofurazone, Sulfa Products, and Neomycin are better choices for sores/wounds. Minocycline is also skin absorbed like Kanamycin (although not as well) which can increase effectiveness. It is also nontoxic to invertebrates but should not be used in Marine aquaria. Minocycline (like other Tetracyclines) is easily absorbed by calcium, making this a POOR choice for saltwater or high GH freshwater aquariums (such as African Cichlids, livebearers), in these cases Kanamycin is the better choice. The above point is often missed by well meaning aquarists (often in many forums that love to recommend Maracyn-2). The reason is that although Maracyn–Two (Minocycline) is a good product/medication when used in the right conditions for the right problem (of which it is relatively wide spectrum), the problem is that most aquariums I have either encountered or have been sent the water parameters for (emailed, etc.) have too high of a mineral level (GH over 200) for Minocycline to be truly effective. In fact there in lies the problem in that often these same minerals that render Maracyn Two less effective, can IMPROVE the fish’ natural ability to fight disease (via better osmoregulation & Redox). Another note about the dangers of Minocycline as with Tetracycline, is that Minocycline becomes dangerous past its expiration date, in other words expired Minocycline can become more toxic over time. With these points in mind, generally the ONLY aquaria I recommend Minocycline in are Amazon River tanks such as Discus Aquariums. Quinine Sulfate/Hydrochloride which is considered the first human anti malarial drug, works by causing a pH elevation in intracellular organelles of parasites, this is thought to disrupt the intracellular transport of membrane components and macromolecules, and phospholipase activity leading to cellular failure of these parasites. Chloroquine was developed from Methylene Blue (also used starting in 1891 as an anti-malarial drug) & Quinine Sulfate in 1934. The formula of Chloroquine & Methylene Blue is also similar (MB: C16H18ClN3S / Chloroquine: C18H26ClN3). As noted, Chloroquine or Chloroquine Phosphate is a related drug to Quinine Sulfate or Quinine Hydrochloride that is more effective from my experience (but also easily and fatally overdosed). When combined with Pyrimethamines as in the product "Marex", it can be very effective for treatment of Oodinium as well as other Ectoparasites and Flukes. Chloroquine Phospate is a drug that degrades quickly in water and must be pure to be effective, with most aquatic sources are not 99% pure. With this in mind be mindful of the discount aquarium product seller placebo product "New Life Spectrum's Ick Shield Pellets", even assuming properly soaked with pharmaceutical grade 99% pure Chloroquine Phosphate (which is doubtful), this product simply cannot work because Chloroquine Phosphate has only been proven to successfully target the free swimming stage of EXTERNAL parasites. Which is why you must dose the powder in a hospital tank. There is no proof it is effective on trophonts feeding on the fish. Even if food soaking were somehow effective on preventing trophonts from attaching, you'd have to be sure each & every one of your fish ate it for 72 consecutive days. Bottom line, AVOID this product. New Life Spectrum ick shield, Snake oil? A better use of Chloroquine Phosphate is in a synergistic combination with Pyrimethamine, which Pyrimethamine is generally used to treat serious parasite infections (toxoplasmosis) of the body. The product "AAP Marex" contains this combination. This combination found in AAP Marex works more quickly than chemical treatments such as copper since it immediately acts on the parasite, including in gill filaments, which copper and many other chemical treatments only act on free swimming stages of many Ectoparasites. This Chloroquine Phosphate/Pyrimethamine combination is the fastest acting treatment I have ever used for Oodinium, although I have often found a follow up treatment with Copper or keeping the main aquarium without fish for 4 weeks will improve long term results. This combination of Chloroquine Phosphate/Pyrimethamine is also an excellent treatment for gill flukes in freshwater and can generally be safely combined with Praziquantel for severe cases. USE: Quinine Sulfate/Hydrochloride is useful for resistant strains of Ich (especially on scale less fish), as well as Protozoan caused sliminess of the skin and Rams disease (symptoms of whirling disease). Also useful for resistant strains of Hexamita when combined with Metronidazole. When Quinine Hydrochloride is combined with Malachite Green, this is one of the most effective and proven Ich and similar single cell ectoparasite treatments available! 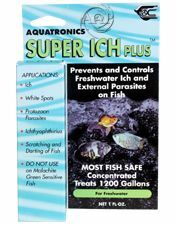 AAP Super Ich Plus is one such product that combines both and is the Ich treatment of choice for difficult cases of Ich (although for sensitive fish such as Cory Cats & Loaches this product/combination should be used at half dose and combined with Triple Sulfa). DOSAGE : 250 mg per 10 gallons of water. Once a day for 4-5 days. Do a 25% water change before each treatment. Quinine Hydrochloride is generally safer than Quinine Sulfate more effective when available. Oxytetracycline is a naturally occurring Tetracycline that is more broad spectrum than Tetracycline Hydrochloride (but not as broad spectrum as Minocycline, especially as to gram negative bacteria). Doxycycline is a wide spectrum antibacterial synthetically derived from oxytetracycline that is generally superior in our aquatic environments. USE: Oxytetracycline & Doxycycline will treat gram-positive (such as Streptococcus) and some gram-negative bacteria (such as some Vibrio species) found in aquarium/pond environments. Maladies include; Body Slime & Cloudy Eyes (its best use), Marine ulcer disease, cold water disease, bacterial hemorrhagic septicemia (Symptoms: Red streaks in body and fins), or redness in the body. Also open sores or loss of scales and mouth fungus. DOSAGE: 250- 500 mg teaspoon per 20 gallons every 48 hours (24 hours for severe problems) with a 50% water change before each treatment. This antibiotic is best used mixed in with food, especially if your ph is above 8.0. *Best not used concurrently with other antibiotics or chemical treatments, although use in a bath with Methylene Blue is OK.
*As with all Tetracycline products, less effective in higher calcium environments (although Doxycycline has a lower affinity for calcium binding than other Tetracyclines). USE: Bactericidal for some gram-positive and many gram-negative bacteria causing disease in fresh water and marine fish. Nitrofurazone inhibits several bacterial enzymes, especially those involved in the aerobic and anaerobic degradation of glucose and pyruvate. Often a good choice for fish wounds or large sores, especially in aquariums with a pH of 7.2 or lower along with a lower GH. Triple Sulfa is the better choice for high pH water or use in a combination with Neomycin or Kanamycin. 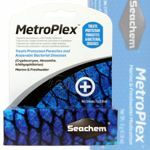 This synthetic antibacterial is effective for control of Flexibacter/Columnaris such as these symptoms: Fuzzy, thin, white coating on the body and fins. It is best combined with Kanamycin for effective treatment of Columnaris pathogens, in fact the COMBINATION of Nitrofurazone and Kanamycin is often the only effective treatment for Columnaris. Nitrofurazone is also often effective for Aeromonas such as these symptoms: fish have blisters forming on the skin that are full of a clear to yellowish fluid, these blisters may turn into large sores. As well Nitrofurazone is often effective for the related Vibrio and similar bacterial species. Nitrofurazone is particularly useful for control of minor topical skin infections of freshwater & marine fishes that have not become systemic. As well, Nitrofurazone is effective for surface skin infections of Streptococcus iniae which may appear as a milky peeling slime. Effective as well against marine ulcer disease and some protozoan infestations. For this reason, Nitrofurazone is a good next step treatment for wounds and other topical infections when first step treatments such as Pimafix or Melafix fail. Nitrofurazone is also useful in treating Furunculosis often found in Koi. Serious adverse events related to nitrofurans are very rare. Acquired resistance of bacteria to nitrofurans during therapy has been rare and has not appeared on a significant scale in over 50 years of use. Do not use in the presence of invertebrates. Nitrofurazone is more effective at lower pH levels, which means use for marine fish is best in baths, NOT the display aquarium! Nitrofurazone is not Skin absorbed, so use of this Bactericidal for systemic infections is NOT recommended. However Aquatronics and myself have found that Nitrofurazone combines well with Kanamycin (which is skin absorbing), and are very complimentary to each other ESPECIALLY when in combined in one medication such as AAP Spectrogram! When Kanamycin and Nitrofurazone are combined and treated 100% concurrently, these medications form a synergistic combination that is not totally understood, but what is known is that often leaving one or the other out of the equation or not using both at full strength often results in failure in treatments of stubborn/advanced bacterial infections such as Columnaris. As well since Nitrofurazone is often better topically for Aeromonas while Kanamycin's skin absorbing properties combine well with Nitrofurazone for Columnaris. Since these bacterial infections are often hard to differentiate by the average aquarist, this can be a good combination when unsure. DOSAGE: 250- 500 mg per 20 gallons. Treat every 48 hours (24 hours for severe problems) with a 50% water change before each treatment. Treat for 10 days. Another form for Nitrofurazone that is especially useful for infections in cooler water environments, goldfish & koi, and even plants (for a 1/2 hour bath/soak) is Nitrofura G (aka Nitrofuracin Green Powder). This product is simply a combination of Nitrofurazone & Methylene Blue. The simple formula is AAP Furan 2 (Nitrofurazone) at regular dose combined with Methylene Blue at 1/2 recommended dose. A more useful combination treatment for un-diagnosable fish diseases and fish die-offs is the use of Furan 2 at full strength along with the Medicated Wonder Shell. The Medicated Wonder Shell has some Methylene Blue, but also has other wide spectrum ingredients for many external parasitic, some internal parasitic, fungal/Saprolegnia and some bacterial problems. As well the product adds essential mineral Cations that ALL fish need for osmoregulation and improved fish immunity. So when the Medicated Wonder Shell is combined with Furan 2 which has more anti-bacterial potential, you get a good wide spectrum treatment that along with correcting any water parameters or other issues can help when other remedies fail. Aquatronics made excellent products starting in the late 60s (many that are simply no longer available in any form), but unfortunately at went out of business in their original form in the early 2000s as I was told for business reasons which continue to haunt and perpetuate within the Aquarium & Pet industry in general, not for lack of excellent reliable aquatic treatments. As a side note, purchasing aquarium products at companies such as Amazon, eBay and many others will likely result in more top notch aquarium information and supply companies disappearing as did Aquatronics, remember this the next time you attempt to save a $1 by purchasing at these types of retailers which likely will also result in stale products too as you not get something for nothing and often these are clearance items by manufacturers/distributors for old product.. While many of these Aquatonics medications can be blended, many simply ceased to exist, but are now being brought back (such as Naladixic Acid, Wound Control/Merbromin, Eye Fungex). AAP Spectrogram is now being brought back as a much more convenient way to utilize the Nitrofurazone/Kanamycin Sulfate wide spectrum combination treatment, especially for difficult cases of Columnaris or Aeromonas. 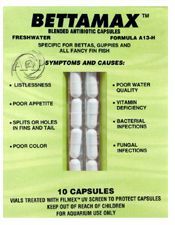 For very serious combination bacterial/fungal/parasitic infections (such as Ichthyophonus or even virus infections such as “Angelfish aids”), especially in often difficult to treat Loach, Botia, Cory Catfish and similar fish. This combination PLUS AAP Super Ich Plus/Greenex OR better, a Medicated Wonder Shell can often be the “kick” needed for a cure, see below. The Medicated Wonder Shell provides the biggest kick when added to the Nitrofurazone/Kanamycin combination (most effective when used at exactly the same time in the synergistic product; AAP Spectrogram), especially if Redox Balance is off with an aquarium that may have already been over medicated resulting in oxidative stress. I often call this and the combinations below my "everything but the kitchen sink" treatments! If used EXACTLY as prescribed, these are some of the better fish treatment combinations I have every used and is especially good when fish are dying suddenly for causes that are not clear. OPTION ONE; (similar to Paragon 2); AAP Furan 2 (Nitrofurazone) OR AAP Triple Sulfa can be combined WITH AAP Kanamycin (AAP Spectrogram combines Kanamycin & Nitrofurazone in a more effective/synergistic combination that treating separately) & AAP Super Ich Plus (or ParaGuard) OR Medicated Wonder Shell for a VERY strong fungal, & bacterial infection treatment. OPTION TWO; (similar to Paragon 1); use Nitrofurazone (AAP Furan 2), AAP Super Ich Plus OR Medicated Wonder Shell, & Metronidazole for an excellent parasitic, fungal, & bacterial infection treatment. PLEASE NOTE; that use of the THREE ingredient combination IS REQUIRED for this to have a decent chance at being effective in severe/critical fish infections!! Using this "in part" rarely works nearly as well since this is a synergistic combination and the three ingredient combination MUST be used. While this can be harsh on the aquarium system, it is generally safe for most fish and a healthy well established aquarium. USE: Neomycin (a Aminoglycoside) is a broad spectrum antibiotic that is effective for aerobic gram-positive, some gram-negative such as Aeromonas of the gut, and occasionally Mycobacterium tuberculosis (Mycobacterium marinum), which is neither Gram-positive nor Gram-negative due to high lipid content in its wall. Neomycin is poorly absorbed internally. The lack of absorption from the gastrointestinal tract is the basis of the main use of Neomycin. Effective for some Gram-negative bacteria- Open red sores or ulcerations, intestinal infections, fin and tail damage. As noted, Neomycin can be effective for wounds, ulcerations, or large sores, however I have found best results when used in combination with Triple Sulfa for such issues (used in a fish bath at double dose can also yield better results). In severe cases where fins and tail are eaten away- treat with Kanamycin for this. As well, Neomycin can be PART of a treatment for mycobacterium tuberculosis (symptoms, weight loss, a distended abdomen, loss of appetite, fin erosion, unusual coloration, spinal deformities, and listless behavior). Aminoglycosides such as Neomycin are mostly ineffective against anaerobic bacteria, fungi, yeast, and viruses. Neomycin is not absorbed by the intestinal tract and is effective in treatment of diseases thereof. But Neomycin can damage the kidneys as it is nephrotoxic when it enters the bloodstream, however since this drug is not readily absorbed in the intestinal tract it is useful for treatment of pathogens such as Aeromonas, particularly of the gut, that can lead to Dropsy or similar diseases. 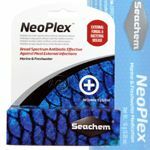 Neomycin works well in freshwater or saltwater aquariums. Neomycin is very effective when used in feeding due to the fact that this antibiotic does not get absorbed. This is my preferred way to treat with this antibiotic. For external use, Neomycin is more limited in use and should be used as you would the Human product; Neosporin. That use would be for minor cuts, injuries, etc., not for major bacterial infections, especially since most major external fish infections are gram negative infections that Neomycin is not effective for. External use would be also similar to recommended use of Melafix. DOSAGE: To prepare medicated fish food with flake, FD, or frozen fish food; Use One Measure (2-5 gallon "in tank" dose) of Neoplex per 15 minute fish food soaking for an average 60 gallon bio load aquarium (I use "just enough" water to mix fish food and Neomycin). After soak, pour entire contents into aquarium. For in tank treatment; 250 mg per 10 gallons of water. Treat every 24 hours with a 25% water change before each treatment. Treat for 10 days. For tuberculosis, use for up to 30 days (Can be and should be combined with other treatments such as Isoniazid for Fish TB). USE: Metronidazoles primary use is for the treatment of anaerobic gram positive bacteria including those that produce beta-lactamase. However, it is not effective against aerobic bacterium. As well Metronidazole is effective for some protozoa (especially internal flagellates). Due to Metronidazole effectiveness against anaerobic bacteria (by selectively blocking some of the cell functions of anaerobic bacteria) this drug along with Neomycin is a good choice for bloating of the digestive tract (common in goldfish). Metronidazole when combined with Neomycin sulfate in a medicated fish food slurry can be a very good full spectrum internal/gut infection treatment, treating both aerobic and anaerobic bacterium. Metronidazole selectively blocks some of the cell functions in anaerobic bacteria, resulting in their demise. Metronidazole is also a good choice for many protozoan parasite infections, especially for Cryptocaryon in marine aquaria. Metronidazole is also effective used in combination or by itself for internal parasites such as Nematodes or Trematodes. In marine aquarium infections is where Metronidazole really shines as it is very effective internally and since Marine fish are always drinking the water around them, medication is easily transported to the infected area. In Freshwater, treatment can be improved by soaking food as well and this is still an effective freshwater treatment as well. It it is also noteworthy that Metronidazole is generally safe for most invertebrates, in particular shrimp and snails. Common aquatic uses for Metronidazole; Hole in the head disease (hexamita), chilodonella, plistophora (parasite disease usually seen in neons and cardinals that causes loss of color, darting, and eventually death. (Please read “Neon Tetra Disease” in the reference section), salt water ich, bloat. Metronidazole can be combined with Nitrofurazone and Methylene Blue (1/2 dose for the Methylene blue) for an alternative treatment for anchor worms, especially for Trichlorfon sensitive fish. Probably the Aquarium Industries top fish remedy manufacturer, Aquatronics (that unfortunately went out of business), used Metronidazole in many of its multi antibiotic remedies as it very useful in combination. DOSAGE: 250-500 mg per 20 gallons. Treat every 48 hours (24 hours for severe problems) with a 25% water change before each treatment. Treat for 10 days. Use One Measure (2-5 gallon "in tank" dose) of Metronidazole per 15 minute fish food soaking for an average 60 gallon bio load aquarium (I use "just enough" water to mix fish food and Neomycin). Metronidazole is often used in treating early stages or for prevention of Neon Tetra & FNT Disease. ABOUT/ USE: An easily absorbed antibiotic, it is used to treat many sensitive gram–negative and some gram–positive bacteria. Kanamycin is a water-soluble aminoglycoside antibiotic that is derived from the bacterium Streptomyces kanamyceticus and has a very low adsorption rate in the intestine of animals including fish. Aminoglycosides work by binding to the bacterial 30S ribosomal subunit, causing misreading of t-RNA, leaving the bacterium unable to synthesize proteins vital to its growth. Aminoglycosides such as Kanamycin are useful in infections involving aerobic gram-negative bacteria such as Columnaris (especially when combined with Nitrofurazone). Kanamycin works especially well in salt water aquariums. As noted a few times earlier in this article, Kanamycin works well combined concurrently with Nitrofurazone for flexibacter (Columnaris), which may includes these symptoms; fuzzy, thin, white "saddles" on the body and fins. Also useful for Pseudomonas-Open red sores or ulcerations, fin and tail damage, fins and tail are eaten away, in severe cases, down to the body. Kanamycin is very effective in high pH applications, especially Vibrio, making it useful for brackish and marine treatments. Kanamycin is easily absorbed skin absorbed, making it an excellent choice for systemic infections. Kanamycin is one of the more effective broad spectrum antibiotics available with recent tests showing it to surpass the Tetracycline class antibiotics in cultures including Minocyline (found in Maracyn II), although Kanacyn has been also been shown in these studies to be even more effective when combined with other antibiotics such as Nitrofurazone or Tetracyclines for a “super” antibiotic effect. Kanamycin can also be used for aquatic Tuberculosis (Mycobacterium marinum), although Isoniazid is often the drug of choice, both can be used together as Isoniazid seems to affect certain active TB bacterium whereas Kanamycin has often different TB activity effectiveness (Kanamycin can also be combined with Neomycin for difficult cases of Mycobacterium marinum. I personally have found this to be one of the more effective antibiotics available (similar properties to Chloramphenicol, although still not as effective as Chloramphenicol which is no longer available in the aquarium trade). Kanamyacin can be effective for symptoms of whirling disease (not actual whirling disease), suspected kidney disease and dropsy. Kanamycin tends to be absorbed quickly by the kidneys which makes it effective for treatment of Kidney infection, but also lends itself to the destruction of the kidneys with over use. Kanamycin sulfate appears to prevent bacteria from making their cell walls, so the cells die. As noted earlier, Kanamycin can be blended with other medications in particular Nitrofurazone to make a synergistic wide spectrum treatment. Best is an already blended medication so that both are treated at the same time for maximum synergistic benefit as is found in AAP Spectrogram especially for difficult cases of Aeromonas or Columnaris. When it comes to treating Columnaris in freshwater aquariums, when Spectrogram's synergistic blend is also combined with the topical treatment of AAP Wound Control/Merbromin as well as fixing stressors that often make Columnaris more virulent, one can have a powerful treatment for this often lethal disease. Kanamycin can also be combined with Furan 2, although not quite as effective since these have different treatment schedules that do not allow for maximum synergistic effect and also separate treatment voids the negative affects of high pH upon Nitrofurazone that the use of AAP Spectrogram over comes. DOSAGE: 500-750 mg per 20 gallons. Treat every 48 hours (24 hours for severe problems) with a 25% water change before each treatment. Treat 3 times or up to 10 days in severe cases (with water changes immediately before each treatment). *While often one of the few aids to treating early onset Dropsy, care should be exercised since Kanamycin will also damage or destroy Kidneys if over used or if the kidneys are already severely compromised. Be careful with mixing Kanamycin & Neomycin (& Sulfa anti-microbials too) in the same treatment mix as this can further increase affects upon kidneys (use separately and even then with care in desperate situations such as Dropsy). Chloramphenicol has in vitro activity against most anaerobic bacteria (gram positive/negative), and aerobic gram-positive bacteria making this one of the more effective antibiotics I have ever used for fish due to its wide spectrum effectiveness, especially as per many aquatic bacterial pathogens (and even some parasites too).